Shane Evans is a really nice guy. I met him a few years ago at a book signing for Mixed Me, a book he illustrated for Taye Diggs. My youngest was so much younger that by then end of the event, both of my kids were crying. Evans personally serenaded my oldest with his guitar. Looking back I wish I had spoken to him directly and complimented him on his work as an illustrator of over 50 books. He is an author too. 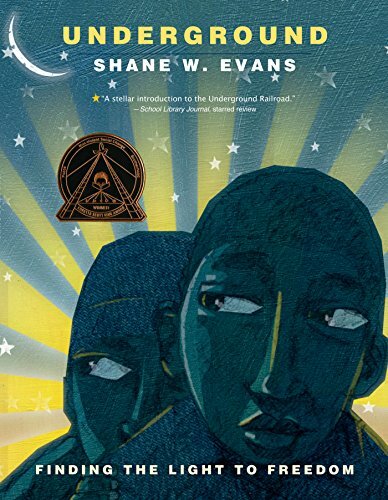 His book, Underground: Finding the Light to Freedom, is the winner of the Coretta Scott King Illustrator Award for 2012. If you are looking for a way to introduce slavery to young children, this would be a good start. There is no blood, gore, or visible violence played out in the story. Told from the runaway's point of view, it gives the reader a chance to feel the range of emotions as they make their way to freedom. It places the reader within the story and allows them to travel to freedom as well. The illustrations are a little more rudimentary than I care for, but the style works well for the age group. The images start out very dark and shrouded in darkness, but become lighter and lighter as the story progressed. Eventually, they are standing in the sun as well as freedom. I also worry that if you don't mention it, it appears that they were able to make the journey in one night. The first time I read it I wasn't too impressed. But when I read it to my children, the empty space that I thought was missing was filled with their questions and comments about the subject matter. They wanted to know more and I was able to fill in age appropriate context. My children have some basic knowledge of slavery in general and Evans' book allowed me to talk more freely about the our specific history. Overall, I would recommend this book for your little ones and to your classrooms.